We propose here a simple and robust approach for meta-analysis of molecular association studies. 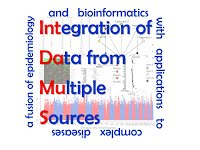 Making use of the binary structure of the data, and by treating the genotypes as independent variables in a logistic regression, we apply a simple and commonly used in Epidemiology methodology that performs quite well, being at the same time very flexible. We present simple tests for detecting heterogeneity and we describe a random effects extension of the method in order to allow for between studies heterogeneity. We derive also simple tests for assessing the most plausible genetic model of inheritance, and its between-studies heterogeneity as well as adjusting for covariates. The methodology introduced here is easily extended in cases with polytomous or continuous outcomes as well as in cases with more than two alleles. We apply the methodology in several already published meta-analyses of genetic association studies with very encouraging results. The main advantages of the proposed methodology is its flexibility and the ease of use, while at the same time covers almost every aspect of a meta-analysis providing overall estimates without the need of multiple comparisons. We anticipate that this simple method would be used in the future in meta-analyses of genetic association studies. The Stata program for fitting the models proposed in this work, is available here metagen.ado (and a help file: metagen.hlp). The program was developed in Stata 8.0 although it is probably functional with older versions (6.0 and 7.0). It requires the gllamm module for fitting the random-effects models.